Right up there with purchasing the perfect-fitting leotard, ballet shoes, or comfy jazz pants is your dance bag. From school to the studio and everywhere in between, it practically becomes an extension of you. You have to love it. The way it looks and feels are definite considerations, but, really, what goes on the inside can make or break a long day of dancing. Here are a handful of necessities to keep packed in your bag, no matter what happens in class or at rehearsal. How many times has a hair band snapped and broke mid-class? Probably, on more occasions than you can count, right? Hair in the face when working on your pirouettes across the floor is no fun. So, having a BLOCH Hair Kit, a travel size bottle of hair spray, or gel will alleviate those hair emergencies. 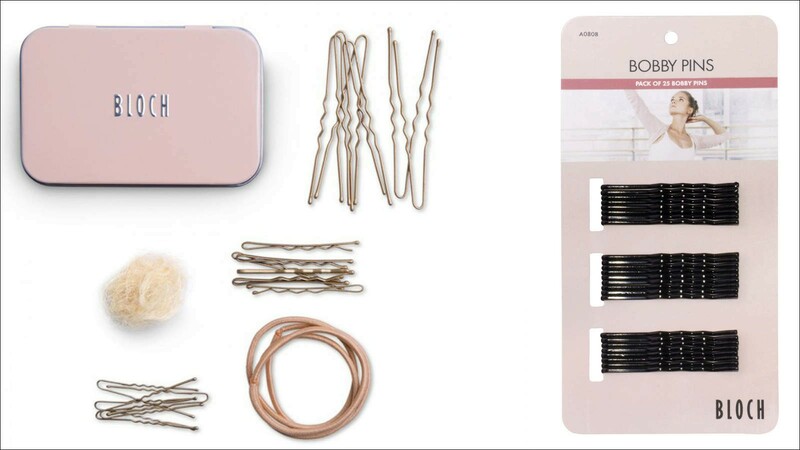 Plus, there’s no such thing as having too many bobby pins in your bag. Healthy snacks can be hard to come by. Keeping a protein bar, dried fruit, or trail mix that’s packed with energy and protein are perfect on-the-go options. When hunger strikes, you’ll be so glad you planned ahead. It will be like finding gold! In case you forget, these munchies won’t perish overnight and can live in your bag for a week or two. Just like your body needs to stay energized and hydrated, maintaining happy, supple muscles is also key to dancer health. For the unannounced metatarsal cramp or to build foot strength, a BLOCH Foot Roller or an Exercise Band are perfect stretching tools to throw in your BLOCH dance bag. Whether it’s in between classes or travelling to the studio, you can squeeze in some warm-up time. Your hard-work as a dancer will without a doubt produce some blood, sweat, and tears. A pesky blister from hours en pointe or a scrape on your knee from an intense floor work combo are inevitable. But no need to worry because those bandages tucked away in your dance bag will keep you safe. Tights rip, shoes break, and the studio’s temperature could change, so having an extra stash of dance clothes in your bag will come in handy. As you become more experienced, having an extra pair of pointe shoes or screws for your tap shoes will also be beneficial for those unforeseen mishaps.